Are you looking for classy hairstyles? Here are the 9 Gorgeous Hairstyles that you can make by yourself to have a Classy look. If you’re looking for a classy, stylish ‘do for a formal event or a cute hairstyle for a romantic date, try a waterfall braid updo! Like any other braid, it’s both stunning and functional, not to mention easy, too! It looks great on long, short, thin, thick, black, brunette, blonde, or almost any type of hair! In this article, you’ll be taught how to do 9 different waterfall braid updo hairstyles. So what are you waiting for? Read on to find out more! Braiding is an ancient art form that started from the African culture more than 5000 years ago as a way to indicate social and marital status, tribal affiliation, age group, power, wealth, and religion. Nowadays, different cultures have embraced this hairstyle and have added their own touch to the classic braiding style, giving birth to the many types of braids we’ve come to know. These include faux braids hairstyles, the French braid, Dutch Braid, Milkmaid braid, Fishtail braid, four-stranded braid, and more! If you want a quick, easy, and stylish way to put up your second-day hair, this waterfall braid updo tutorial can help! Part your hair and grab a section on the heavy side. Use this to create a waterfall braid. If you’re wondering how to make waterfall hairstyle, start by parting your hair into three sections and doing a regular braid but dropping strands as you go. Do this until you reach your left ear. Brush up all of the remaining hair and waterfall strands into a high ponytail. Twist the ponytail into a bun. One of the most useful hair spray life hacks: spray hairspray on any braided hairstyle to make it stay beautiful longer! This Waterfall Braid Updo is a combination of a French braid, a fishtail braid, and waterfall braid wrapped into a low bun. It was inspired by many different ideas but doesn’t look too overdone or disorganized. It’s great for a day in the office, a dance, a date, or any special occasion. Part your hair near one side. Separate a section from the back of the crown. Do waterfall braid with the front portion until you reach your nape on the opposite side of your head. Finish the ends with a regular braid and secure. French braid the waterfall strands. Create a bun but don’t make it too tight. Pull the edges of the bun and braid for a more dramatic effect. With the remaining hair section, create a fishtail braid and wrap this around the bun. Secure with pins. Try this next hairstyle for an easy, modern, edgy, and cool look perfect for both a casual stroll and a formal event! Part your hair to make a triangle shape on the front part of your head. Take a hair section and create a waterfall braid until you reach your nape, braiding across the back of your head and finishing the ends with a regular braid. Tuck the end braid under the rest of your hair with a pin. Smooth flyaways and curl the ends of your hair for a soft finish. Try this cute and fun flower braid and waterfall braid combo that will complete a boho outfit or a romantic, feminine look. Make a waterfall braid from one side of the head until halfway across the head. With a front section of hair from the other side and the ends of the waterfall braid, make a French Braid and secure. For volume, tug at the strands on one side of the braid. This will be the petals of the flower bun. Roll the braid with the pulled side outward. Secure the bun with pins. This fancy and elegant bun requires some skills but with practice can be done as quickly and easily as other braids. Part your hair and grab a large hair section from the heavy side. Divide into a front and back section. Waterfall braid the back section, letting front strands fall until you reach your nape. Tie the braid. French braid the waterfall strands and the front section together and secure. Take two small sections of hair from the other side of your part and braid these, securing with elastics. Gather all your hair into a low sided ponytail and remove the hair elastics. Make two fishtail braids. Wrap these around each other in an intricate-looking bun. What’s an easy way to change up you beloved braid without letting it go completely? Inverting it! This inverted fishtail braid with a waterfall braid is one of the most beautiful hairstyles to do for a fresh, new look. Create a part on the right side of your head and another down to your left ear. Waterfall braid the front portion, letting the backmost strands fall down. Repeat until you reach the ends, finishing off with a regular braid and securing with a hair tie. Combine the waterfall strands with the back section of the hair into an inverted fishtail braid. Do this by crossing the strands underneath instead of above the braid. Finish the ends with a regular fishtail braid and tie with an elastic. This look seems complicated but is actually very easy to do. Wear it to show off your braiding skills! Divide your hair into three sections and pin down the sides. Braid the middle section but each time you are about to finish one cycle of the braid, drop down the strand you are about to put over the middle into a waterfall braid. Pull another hair section behind that fallen strand and cross this over instead. Continue up to the crown of your head and secure with a pin. You should be left with waterfall strands on both sides of the middle braid. 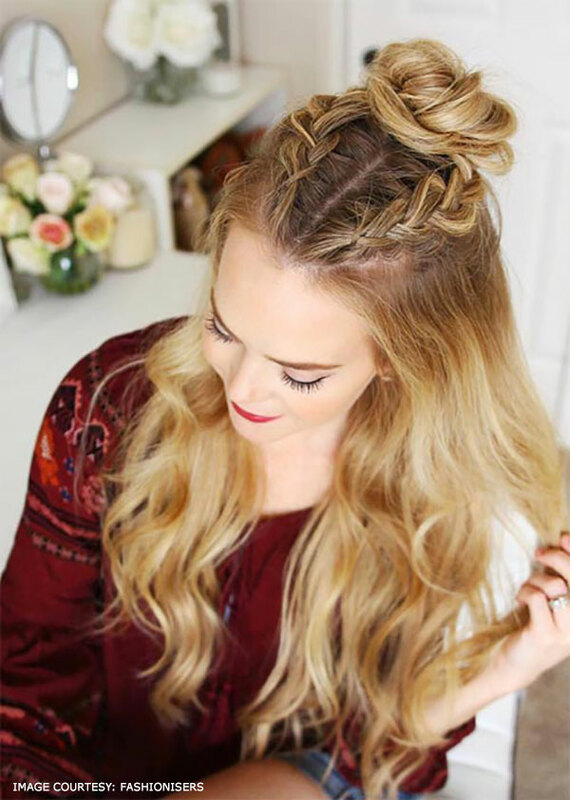 Take each of the pinned down portions of your hair on both sides and combine them with the waterfall strands into French braids. Wrap the unbraided hair into a messy bun. This classy and elegant hairstyle can be one of the best waterfall braid updos for prom. It’s sleek and stylish but is feminine and relaxed as well. Part your hair on the right side and divide two front sections by creating a horizontal section from the top part to each ear. Secure these two side sections away with clips. Divide the remaining hair into a top and bottom section. Wrap an elastic around the bottom section to make a low bun, securing it with pins. Separate the top section into three parts. Grab the middle part, twist it, and push it upward to create volume. Secure with a pin. Divide hair into several one-inch portions. Twist and wrap each portion around the low bun, leaving only the left clipped part from the first step behind. Grab a small strand of hair near the back of the clipped part. Use this to make a waterfall braid going down to the left ear by dropping the front strands. Secure the end with a hair tie. Pick another small portion of hair on the front of this waterfall braid and create another one. Tie the ends of the braid and pin them behind the left ear. Twist and wrap the ends around the bun and finish with some hairspray. Grab all your hair into a tight high ponytail and secure. Create a large regular braid, French braid, Dutch braid, or fishtail braid using this ponytail and twist into a bun. You may also leave out a few hair strands to frame your face and pull on the sides of the braid for a messy look. What Are Some Accessories Tips To Style With Waterfall Braid Updo? Incorporate gold or silver chains, a scarf, ropes, ribbons, or even a bracelet into your braids. Add some real or artificial flowers and shrubbery for a rustic feel. Accentuate with gold or silver hair combs, pins, or clips. That’s it! Good luck and have a great hair day!